I’m still in the process of setting everything up, which is why i haven’t posted recently, but I’ve moved the site. Defining this sports age in one word…Cheaters. This post has moved to my new site. Spygate…honestly, its a little out of hand. Thought you were done with spygate, didn’t you? thought you’d never see this great picture again? Mayer’s lawsuit maintains that because teams other than the Jets have found or believed that the Patriots have illegally taped NFL games, that Jets ticket holders should be compensated for any game played between the Jets and Patriots since Belichick became the Patriots coach in 2000. I know, i know, some of you might be doubting the merit of this lawsuit. Rest easy though…once you hear about how much money they’re suing for, your fears will be assuaged. Good to see they’re only worried about the integrity of the game of football. Now, i haven’t read all of RICO or the deceptive business practices act, but it really seems like this lawsuit is giving us lawyers a bad name. Shouldn’t they be following this lawsuit up with lawsuits against anyone who watches video tape before next weeks game? Aren’t they giving themselves an unfair advantage then too? Don’t get me wrong, I completely disagree with the Patriots actions, as I’ve discussed previously, but a $180 million dollar lawsuit? That’s laughable. Sports Agent News: …that whole Jets/Reche Caldwell thing seems pretty tame now, doesn’t it? Mike Vick…well, at least he’s fast, right? You have seriously got to be kidding me. No, seriously. A day after ESPN decided to hold their Michael Vick town meeting (honestly ESPN…this was the worst idea ever…you did nothing but continue to strengthen the racial divide between whites and blacks in Atlanta. Besides that…this was a little late, yes? He pleaded guilty almost a month ago…you are ESPN for goodness sakes; you couldn’t get the panel together any faster? 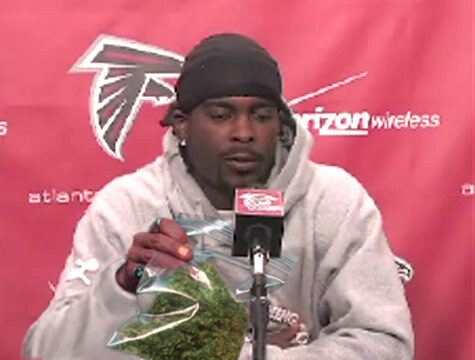 ), and there was a large outpour of support for Vick, we have some not so positive Michael Vick news…he’s tested positive for marijuana usage. The result? U.S. District Judge Henry Hudson ordered Vick confined to his home between 10pm and 6am with electronic monitoring and he has to submit to random drug testing. Honestly, what more could Michael Vick do wrong? The only way he could make this situation worse is if he hi-jacked a plane or something. If you are already in trouble for arguably the biggest sports story in the last 10 years, and then you get a small reprieve with Bill Belichick and the Patriots spygate incident, and then what do you do? bring yourself right back into the spotlight with your failed urine test. What’s the old adage? Fool me once, shame on you, fool me twice, shame on me. The bad part for Michael Vick? I think Judge Hudson knows the adage as well. I was going to write a post on this, but the post over at True Hoop is excellent, and I suggest you go read that instead. If Marion does leave, it will be interesting to see what kind of money he gets. Apparently his biggest suitors are the Jazz (trade for Kirilenko maybe in the works? ), the Lakers (trade for Odom? ), or possibly the Heat (they will definitely be contenders with Wade and Shaq, if this happens). Marion has always been a player that, when you see him, you recognize that he’s good, but his name never comes up if you’re just naming superstar players off the top of your head. I honestly believe that he feels under appreciated in Phoenix…but, is going to the Lakers going to any of the above mentioned teams going to help? I don’t think he’d truly feel good about everything until he went to a horrible team where he was the only superstar (or at least the man superstar). Marion is represented by Dan Fegan of Fegan & Associates. His contact information can be found here. Never doubt Milton Bradley again! As most of you probably already know, the whole incident started after a Bradley strike out in the 5th inning, of a game between the Padres and Rockies, when Winters thought Bradley tossed his bat at home plate umpire Brian Runge. After Bradley singled in the 7th inning, he got to first base and asked Winters if he told Runge that he (Bradley) threw his bat at Runge. Winters said he did say that, and all hell broke loose. Padres first base coach Bobby Meacham tried to restrain Bradley, and when he was unable to do so, Black grabbed a hold of Bradley as well, taking him to the ground, when Bradley subsequently injured his knee. So, who was in the wrong in this crazy situation? Mike Winters. Major League Baseball has suspended Mike Winters for the rest of the season. The reason given? For using profanity aimed at Bradley. All I can say is, never doubt Milton Bradley again. It’s kind of funny how people build up a reputation, and they are just automatically blamed (or praised depending on the situation) just based off of their past experiences. Ronaldinho to Chelsea!!! Well, not anytime soon. On Tuesday, the Sun Online, the epitome of fact checking and accurate reporting, reported that world renowned soccer star Ronaldinho accepted a 5 year deal to leave his present team, Barcelona, and sign a 5 year deal worth £58 million (about 117 million U.S. dollars) with Chelsea. It is important to note that no other source has confirmed or denied Ronaldinho’s signing in writing (i.e. soccernet, goal.com, etc.) although it was shown on ESPN’s ticker, and discussed on Pardon the Interruption, and Fox Soccer Report. Any written references to this situation have only been piggybacks on the Sun’s article, and even the Sun article said that Ronaldinho still had the option to turn down the deal (I assume there is some provision in his contract that allows him to do this? It seems odd to be able to accept a deal, then revoke your acceptance for apparently no good reason – ed.note). So, why is Ronaldinho not on his way to Chelsea right now (assuming this deal is real)? Well, for one, for those of you not studying your FIFA rulebook, the next transfer window isn’t until December 31st 2007, with the last window ending on August 31st (A transfer window is analogous to the trading period and trade deadline in the NFL. You can read more about transfer windows here) meaning that even if this deal were to happen, it seems as if Ronaldinho would not play any games for Chelsea till January 2008, at the earliest. Furthermore, Chelsea would have to pay a transfer fee to Barcelona for Ronaldinho’s services (he still has 3 years remaining on his current contract); a fee which the Sun is reporting will reach upwards of £70M. So, while Ronaldinho may be on his way to Chelsea, its definitely not happening anytime soon, and there are certainly a lot of details that need to be worked out before it happens. If it does happen though, his salary (almost $25 million a year for 5 years) would be truly incredible. It could definitely be an Alex Rodriguez/Scott Boras starting point. Ronaldinho is represented by his brother, Roberto de Assis. Unfortunately, I’m not quite sure how to contact him. I wish I was your agent: Chad Johnson edition. When you think of players to watch in the NFL, at some point early on in your thinking, you have to think of Cincinnati Bengals Wide Receiver Chad Johnson, a.k.a. ocho cinco. First off, who even takes the time to turn their number into Spanish (albeit not quite correctly) in honor of Hispanic Heritage Month? And lets not forget the hilarious touch down celebrations. (Ed Note: If you think the NFL needs to get rid of the TD celebrations, you are part of what is wrong with the NFL! The job of the football player is to entertain the fan, and you can hardly say that the TD celebrations were not entertaining. Fine them if they take too long, give them a delay of game penalty or something, but stop taking them away!). From proposing to a cheerleader, to river dancing, to claiming he belongs in the hall of fame, if nothing else, you have to love Chad because he entertains in ways that a vast majority of the NFL either can’t or refuses to do. …Oh, and did I mention he can play football as well? Chad Johnson is represented by the Shark, Drew Rosenhaus. His site can be found here. To the extent that federal law does not govern the implementation of this Agreement, this Agreement shall be construed and interpreted under, and shall be governed by, the laws applicable to contracts made and performed in the State of New York. So, this is pretty self explanatory, but its just a little note to you future sports agents out there…know your federal law, and you might want to look into New York law as well…you never know when it might come in handy. The rest of the NFL’s collective bargaining agreement can be found here.